So, on the final day of the four-day weekend, rain set in for the day. Nothing for it but to go to my craft room and play! 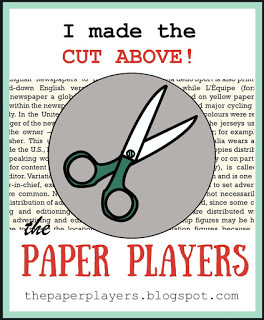 Just in time to catch the Pals Paper Arts Challenge. An unusual sketch this week - I think I'm just not confident around these off-square layers and panels. 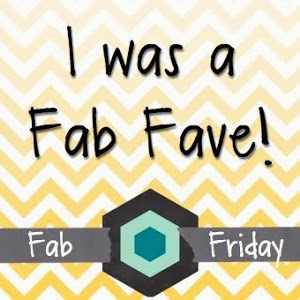 So here's my rainy Monday take on it - aiming for cheerful! OK, so now shamelessly taking advantage of day three of a four day weekend, with a second card and post on the same day. Freshly Made Sketches - I love them because so many people enter and it's such fun to see how so many people interpret the same inspiration. The sketches are always so great - in the old days, we'd have wished for a book to keep them all in, instead of an on-line archive! Anyway, saw this sketch the day it was released and spent some time thinking about it. So many ideas but none settled. Until today, when I saw my Kinda Eclectic set. I wanted something fun and bright to use as a special kind of thank you card and here's what I ended up with. Other: Crumb Cake Candy Dot, Linen twine, button from the button jar, dimensional bits to hold up the top butterfly's wings, Early Espresso marker to outline and define all cut shapes. I often look at Retrosketches, because so many lovely cards show up there but until today I've never entered one. When I saw today's sketch, a card formed in my head and I dropped all other plans for a sunny spring Sunday and headed straight into my craft room. I've been thinking wedding cards of late as my daughter keeps filling me in on the wedding she is going to be a bridesmaid for in summer. So, a collision of ideas, stars in alignment or something. 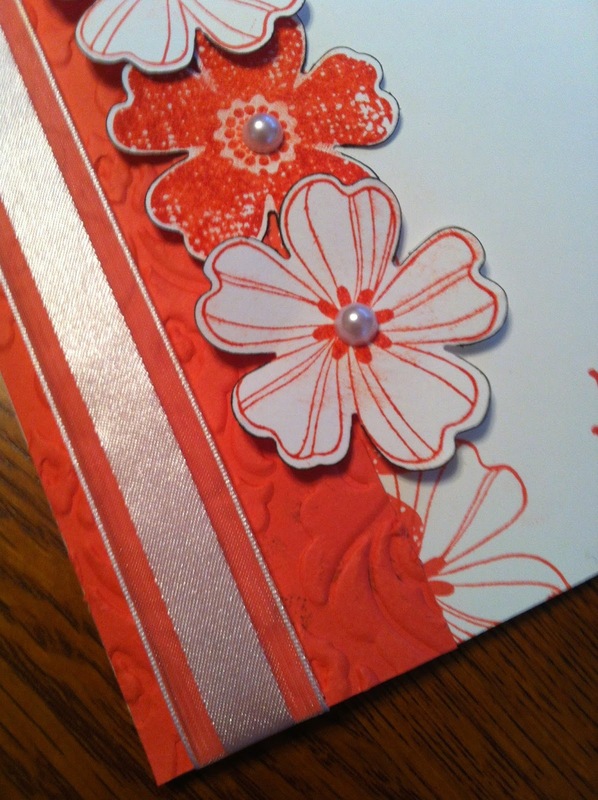 The new thing I did on this card is the beading. I raided my bead jar and found the star-shaped beads left over from a Christmas angel project. I placed them and pierced a hole through the two layers (embossed and white) and sewed the small gold bead on top of the star bead so it looked more like a flower, before fixing to the gold layer. 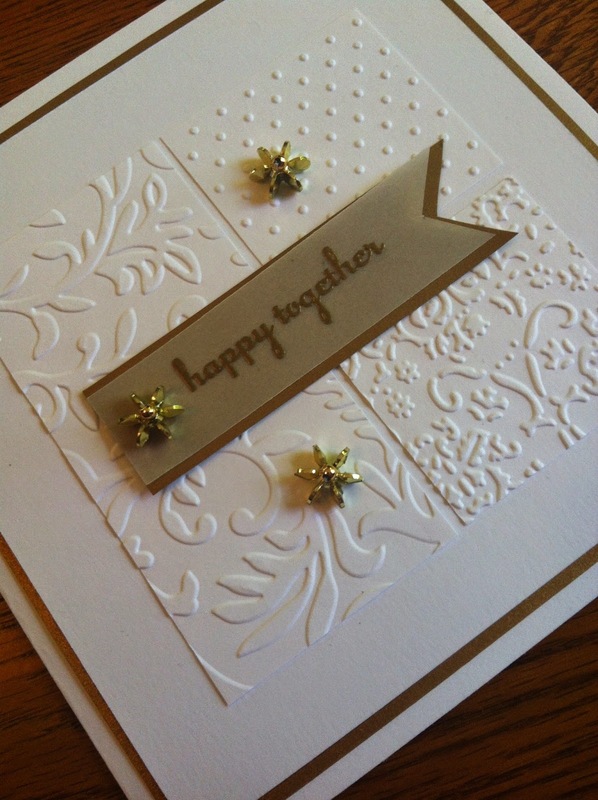 The sentiment is gold embossed onto vellum and layered onto gold paper. Update: I was so delighted to have this card selected as a Shout Out at Retrosketches. Other: Gold embossing powder, embossing folders - Swiss Dot, Victoria, Textile. 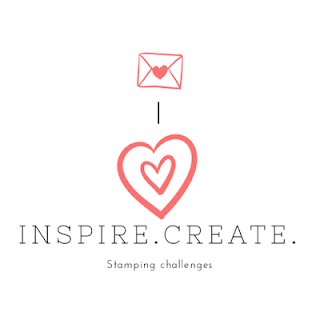 So excited to see that this week's challenge at Just Add Ink is a technique challenge: clear block stamping. 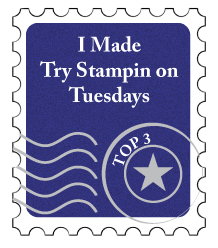 I can't believe that in the time I've been stamping, it never occurred to me to use the actual acrylic block as a stamp! 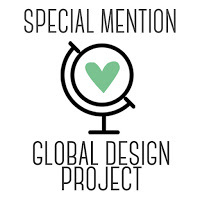 Like all great ideas, so simple... once someone points it out! So, I've spent the morning experimenting with using different combinations of colours and what happens if you do different things with the ink pad and how (or if) you dampen the ink afterwards. SO interesting! Anyway, what I came up with as the starting point was to apply two colours (Soft Suede and Lost Lagoon) to the block by pressing and by swiping. Then I huffed on it. From my experiments, this seemed to give an effect half-way between stamping with dry ink and spritzing it with a mister. This gave a hazy effect somewhat like a beach, from which the rest of the card developed. To heighten the beach effect, I added in a row of small pearl beading at the joining point to simulate wavelets on the shoreline. The tricky part there was cutting and applying single pearls in between the stalks of the beach grass stamping so they would still continue to appear to occupy the foreground. It seems quite difficult to believe that the two sea-shells are stamped and sponged using Soft Suede and that the beach stamping with the acrylic block was also in Soft Suede. They look like quite different colours. The starfish is stamped in Early Espresso (but still sponged quite heavily with Soft Suede) so that the darker colour would give a greater sense of depth and perspective. Pretty happy with this card. 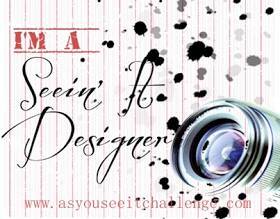 Thanks to the Just Add Ink team for the great challenge to get the creative juices flowing. Other: Lost Lagoon ribbon, Linen twine, dimensionals to lift the white panel, the focal panel, the starfish and the white panel of the sentiment, sponge, Early Espresso marker to outline and define all cut pieces and great scissors to fussy cut the shells and starfish, about 10cm pearl beading. 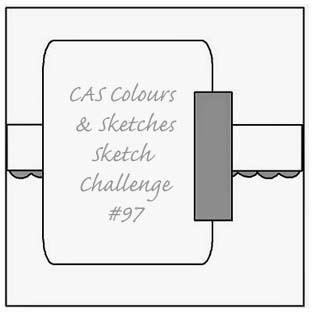 The long weekend has given me a chance to look around the challenges again and luckily a lot of challenges come on a Thursday or Friday, including CAS Colours and Sketches. Being an even week, this time it is a sketch and I've never done one of their sketches before. As I looked at it, I kept seeing a Christmas tree on the side, in front of a window looking out to the evening. So I played with the idea, and this is what I came up with. 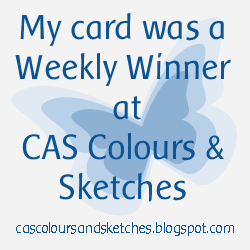 Update: This card was a top 3 pick at CAS Colour and Sketches. 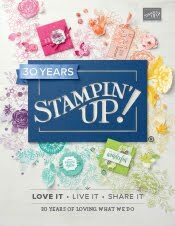 Inks: Wild Wasabi, Cherry Cobbler, Mossy Meadow (for actual stamping), Marina Mist, Island Indigo and Night of Navy sponged for the sky. Other: Dimensionals for the tree, bucket and sentiment, oval framelits, coloured markers to edge and define the cut shapes, corner rounder punch, Wild Wasabi ribbon. Being back at work has really cut down my card-making time but this wet Sunday afternoon, I thought I'd have a go at this week's Pals Paper Arts sketch. I started with Bright and Beautiful, since it was sitting on my desk looking at me accusingly - it's not seen enough action. I gold embossed a star, cut it out with framelits and edged it with Always Artichoke marker and put it up on dimensionals. The greeting is also gold embossed. Under the linen thread is an organza ribbon with a hint of glitter in it and the whole Very Vanilla panel is mounted onto Always Artichoke. 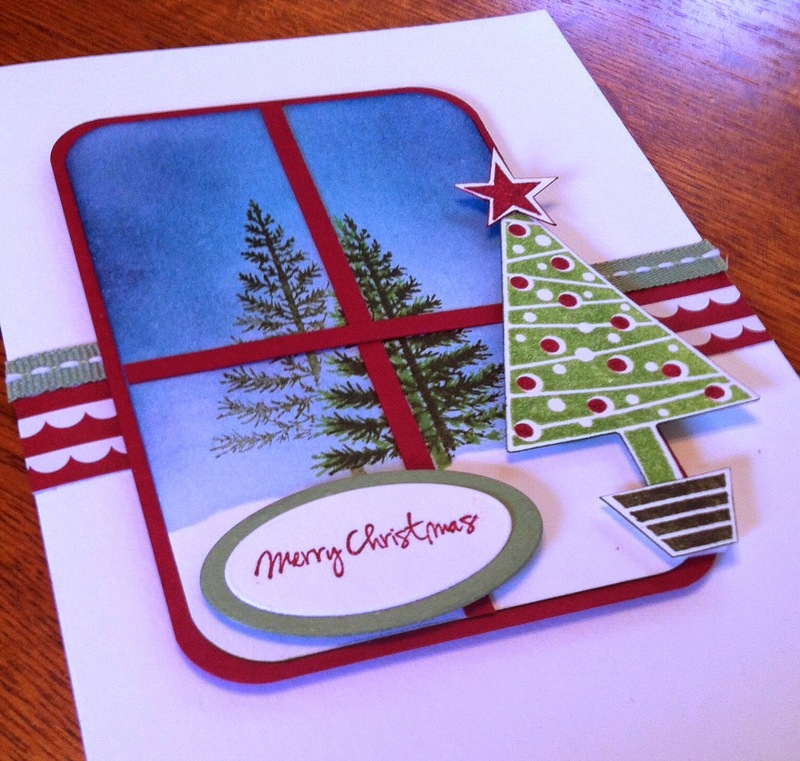 The Very Vanilla card base has four strips of scraps from Kaisercraft's Just Believe Christmas collection. I kept the base pretty straightforward so the focus stayed on the panel. 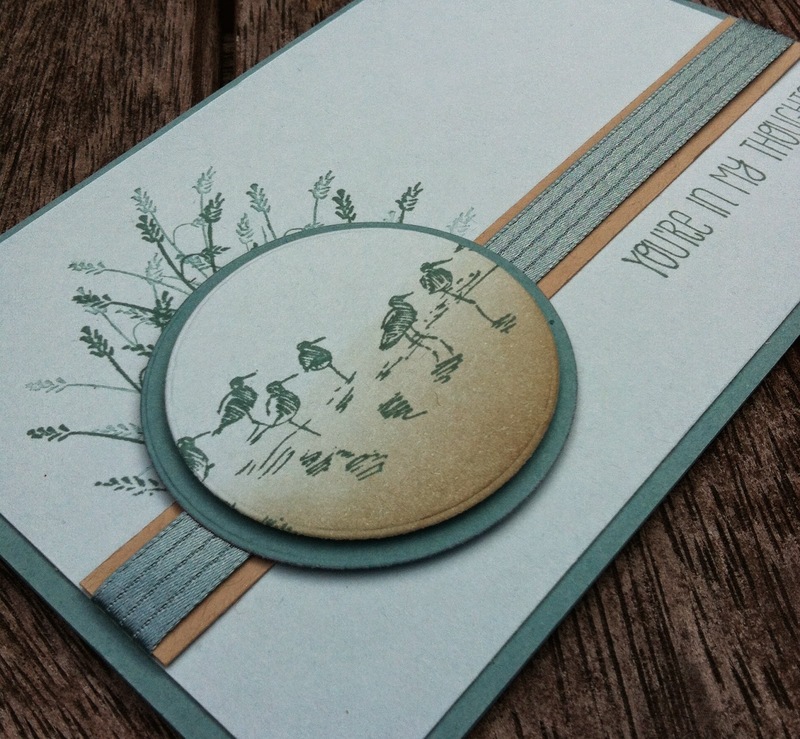 Paper: Very Vanilla, Always Artichoke, Kaisercraft Just Believe. Other: Gold embossing powder, heat tool, dimensionals, organza ribbon, linen thread, star framelits, Always Artichoke marker. 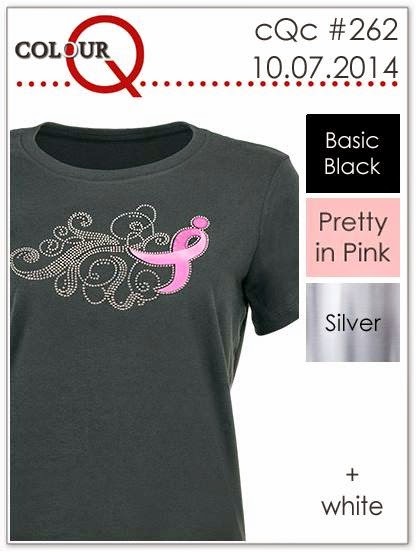 I've never entered a Colour Q challenge before but the Breast Cancer Awareness colours were very tempting and as a young friend of mine was diagnosed with the disease only a few days ago, it was a subject close to home. The body and under-layer of the dragonfly's wings are silver but are harder to see in the photo than in reality. 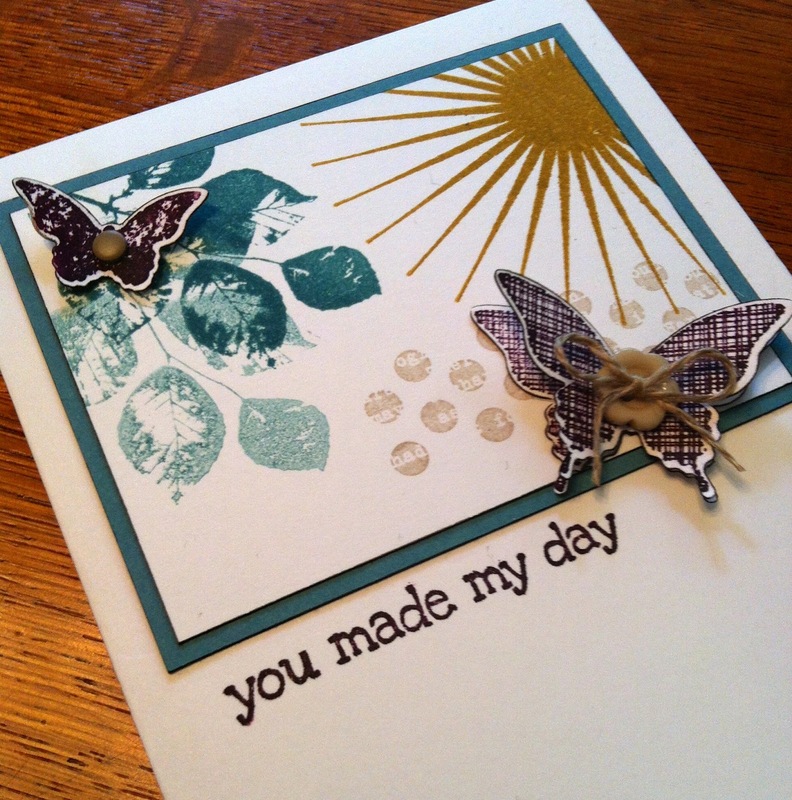 Stamps: Gorgeous Grunge, sentiment from an unknown SU set. Other: Tattered Angels dragonfly die, Kaisercraft Black rhinestones, glue, glue dots, dimensionals to lift the top white layer, black marker for outlining the edges of the layers. The sketch challenge at Create with Connie and Mary this week really got me thinking. The asymmetry of the panel made me decide to be really literal in my approach to the sketch and to use bold colours. Here is the lovely sketch. The only liberty I took with the sketch was quite minor. 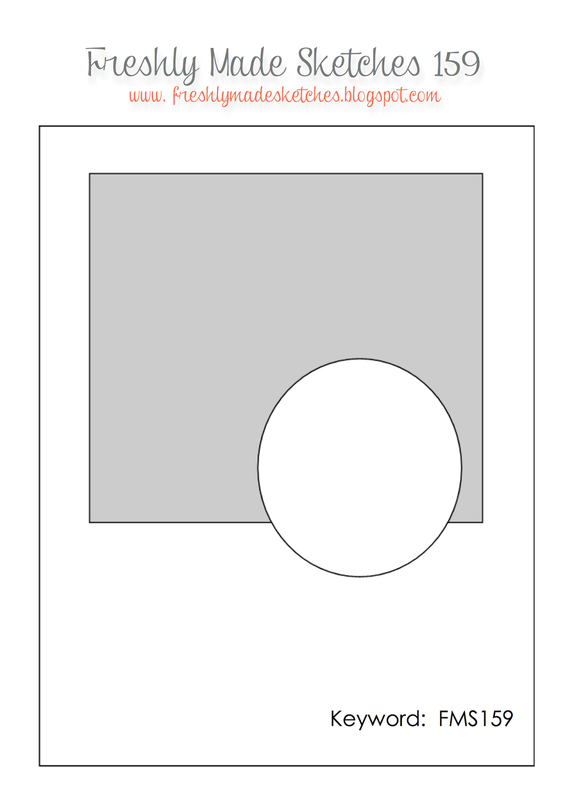 I added a frame to the circle and raised it up on dimensionals to give more of a window effect. Originally I used full-strength, then second-generation Mossy Meadow for the leaves but it made things just too busy so opted instead for a second generation Mossy Meadow and a Sahara Sand branch. This not only gave more focus to the butterfly but also helped tie all the colours together harmoniously. Thanks for a fun challenge sketch! 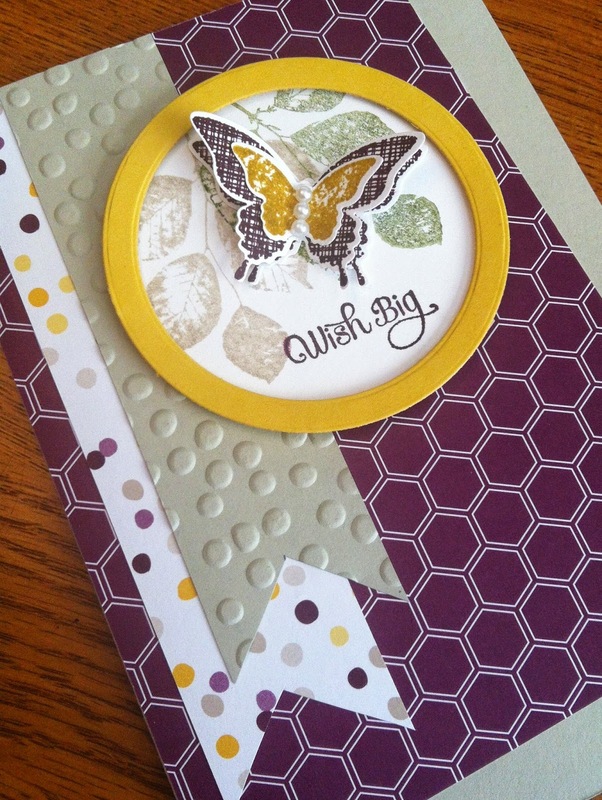 Paper: Whisper White, Sahara Sand, Hello Honey and Moonlight DSP stack. 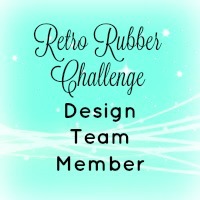 Other: Circle framelits, Dimensionals, Pearls, Decorative Dots embossing folder. It's school holidays, so I've had a lot of time to get into my craft room. 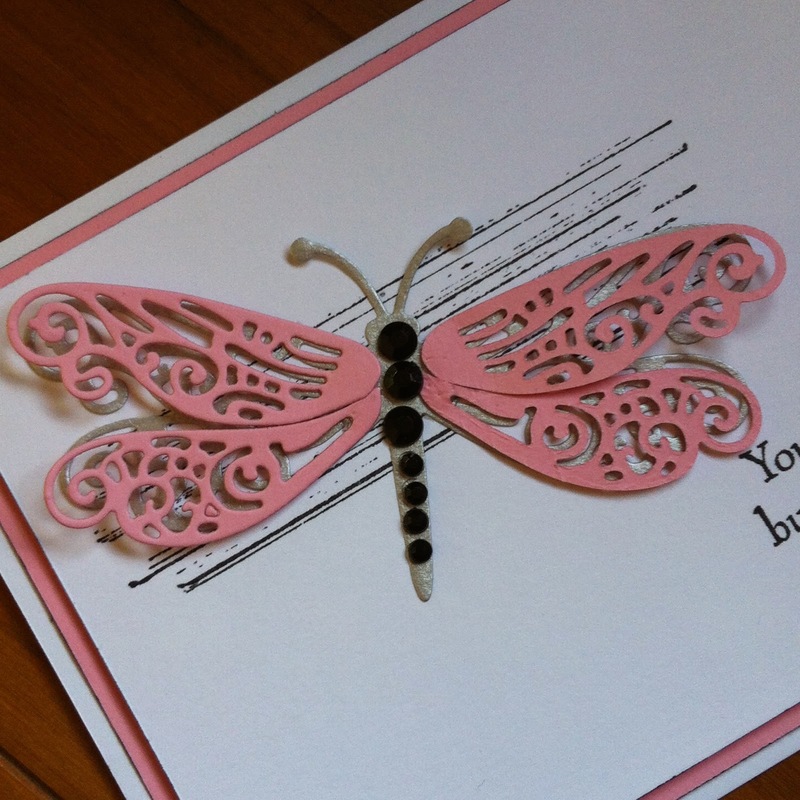 Consequently, I've made a few cards in the last week. A few days ago, I made my first ever baby card and entered it into Freshly Made Sketches then discovered that Just Add Ink #234 was a theme challenge - Just Add Baby. So since it was a girl card for FMS, I made a companion boy card for this challenge. 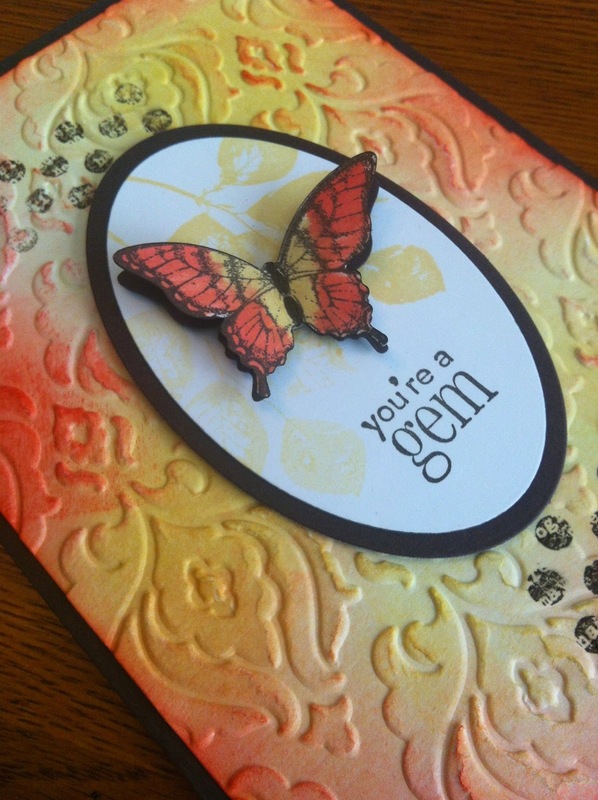 I used the Kaisercraft Pitter Patter 15cm paper pad for the DSP and the matching clear stamp set. 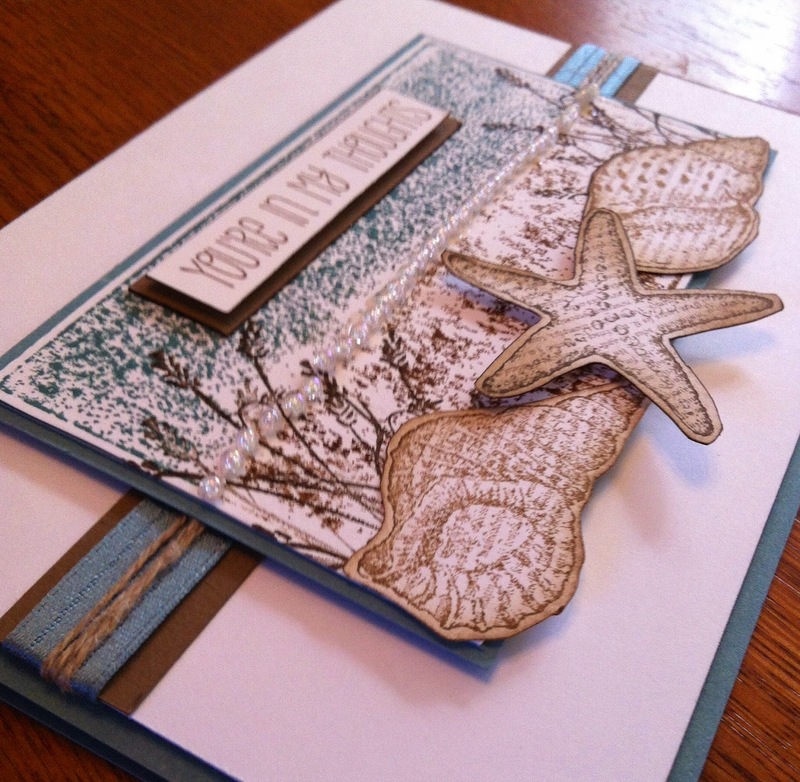 I stumbled upon CAS - Colour and Sketches in time for the release of challenge #94, a super colour challenge using two of my favourites, Crumb Cake and Lost Lagoon and a colour I've never used before, Soft Sky. Such a sweet colour, I can't believe it has languished at the bottom of my Subtles collection box, unused for this long. To me, the colours spoke of a soft, whimsical, slightly melancholy mood so I've ended up with a sympathy card or illness/hardship card. 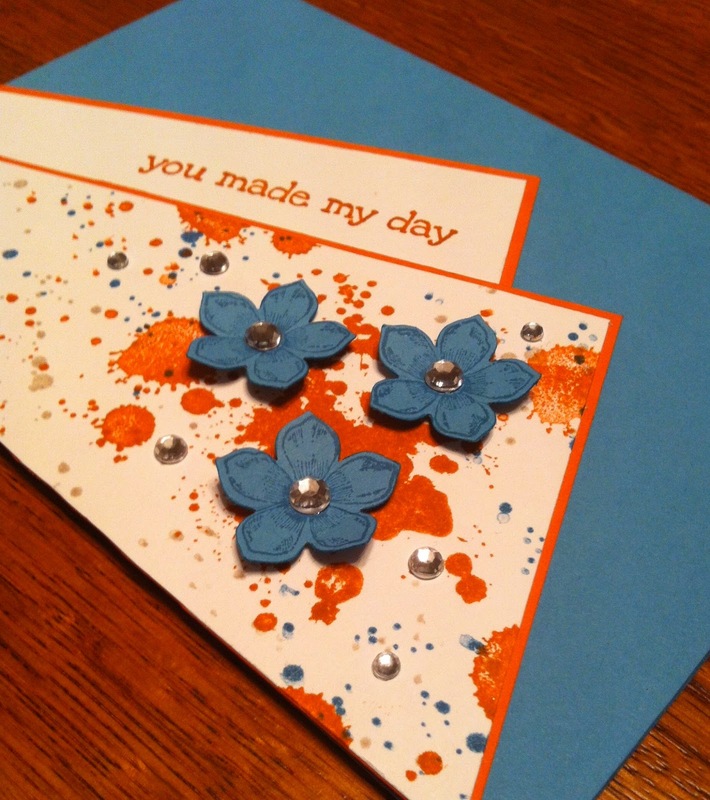 Using the Soft Sky as the basis for the card front instead of white help to add to the softness of the mood. Sponging Crumb Cake onto the Soft Sky circle worked well to give a sandy ground to the birds. Initially I had not thought to stamp the plant in behind the circle but doing so both helped to ground it and balanced the greeting below the strip. 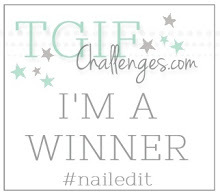 Update: This card was selected in the Top 3 for this challenge. This morning I worked happily on the Pals Paper Plus colour challenge using Early Espresso, So Saffron and Calypso Coral. This afternoon the sunny spring weather disappeared and a cold change set in, so it was back to my scrapbooking room, where the ink pads from this morning were still sitting on the desk. 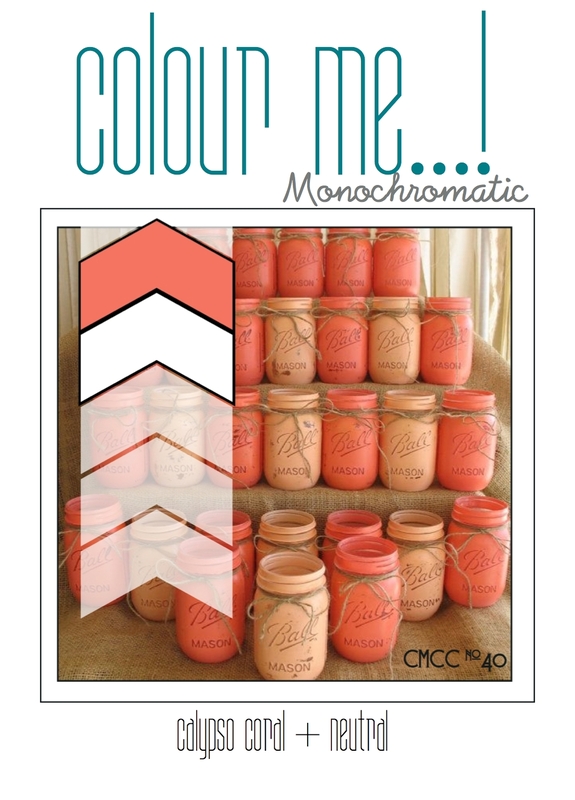 As I put them away, the Calypso Coral reminded me of the monochromatic challenge I'd seen at Colour Me. I used the Beautifully Baroque embossing folder on the Calypso Coral strip to give texture and the Whisper White ribbon to echo the vertical and to soften the block of colour. The Flower Shoppe flowers are on three levels to give a sense of depth: those stamped on the base and peeking out from under the strip and the two levels of the punched out flowers. Stamps: Flower Shoppe, unknown sentiment stamp bought second hand. 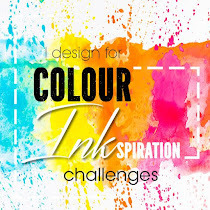 This week's challenge at Pals Paper Arts is a colour challenge. Such delicious colours! Today is a fine spring day with the faint promise of summer, so the colours put me in mind of monarch butterflies and that was the starting point for this card. 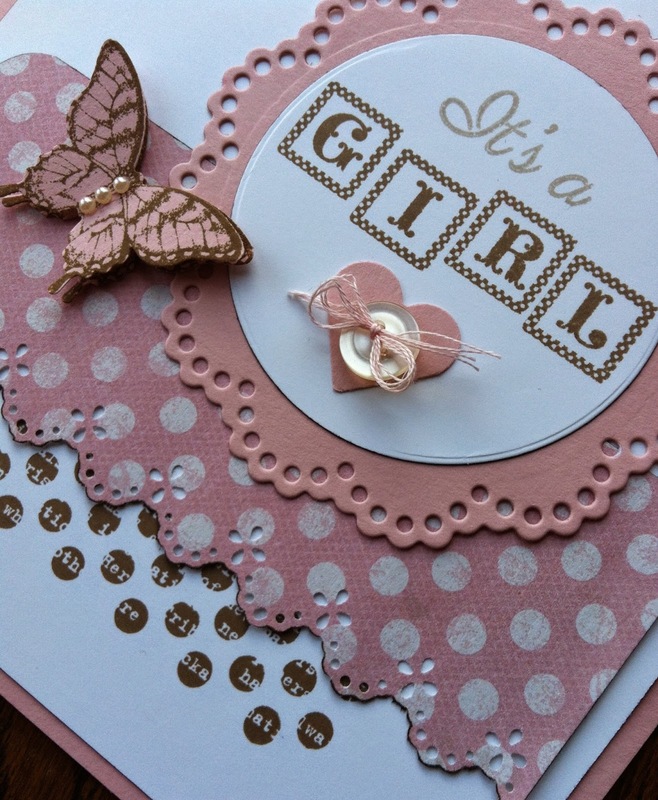 I also was very keen to experiment with embossed and coloured backgrounds after seeing the most beautiful card at Just Add Ink by Amy, last week's winner of the sketch challenge there. To create the background I started with a piece of Whisper White and sponged So Saffron, at varying intensities, over the whole piece. Then I sponged Calypso Coral mainly around the edges and again at various intensities. I stamped in Early Espresso using Kinda Eclectic then embossed the whole thing with the Beautiful Baroque folder. Then I used the sponge again to lightly swipe over some of the raised areas with Calypso Coral and So Saffron. 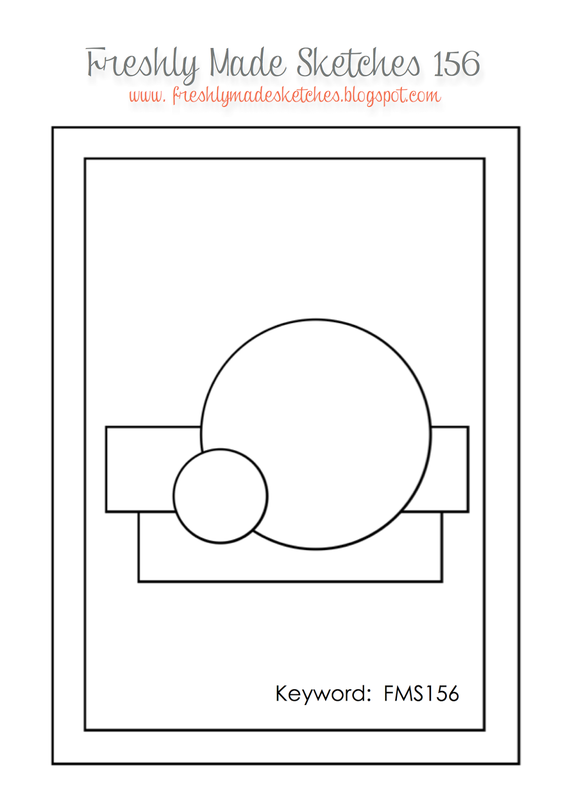 The focal oval is stamped twice on the same inking with So Saffron and the leaf from Kinda Eclectic. The butterfly I stamped in Early Espresso and then used cotton buds to paint on So Saffron and Calypso Coral to get a monarch butterfly effect. The flat butterfly underneath is punched out of Early Espresso so gives a shadow effect and the coloured butterfly has its wings supported by small bits of a dimensional. Other: Beautifully Baroque embossing folder, Oval framelits, Butterfly punch, dimensionals, Early Espresso marker to colour the edges of cut shapes, sponges. 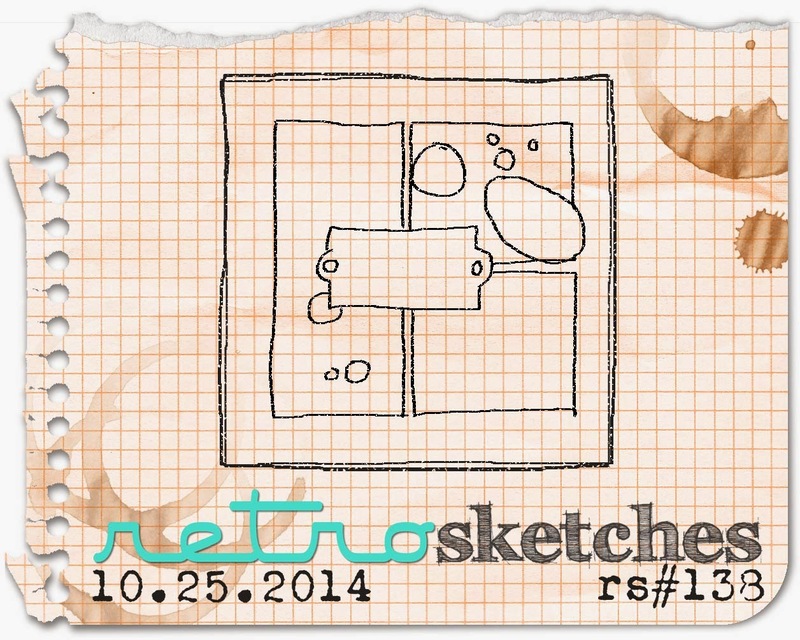 When I saw this week's sketch at Freshly Made Sketches, I initially thought of entirely using my Kinda Eclectic set but then my eyes fell on the baby stamp set I bought at Spotlight last week. So I got to thinking of baby cards. Maybe it was a case of wishful thinking, since I think my grandma years are still a way away yet! Here is the lovely sketch by Narelle Farrugia. 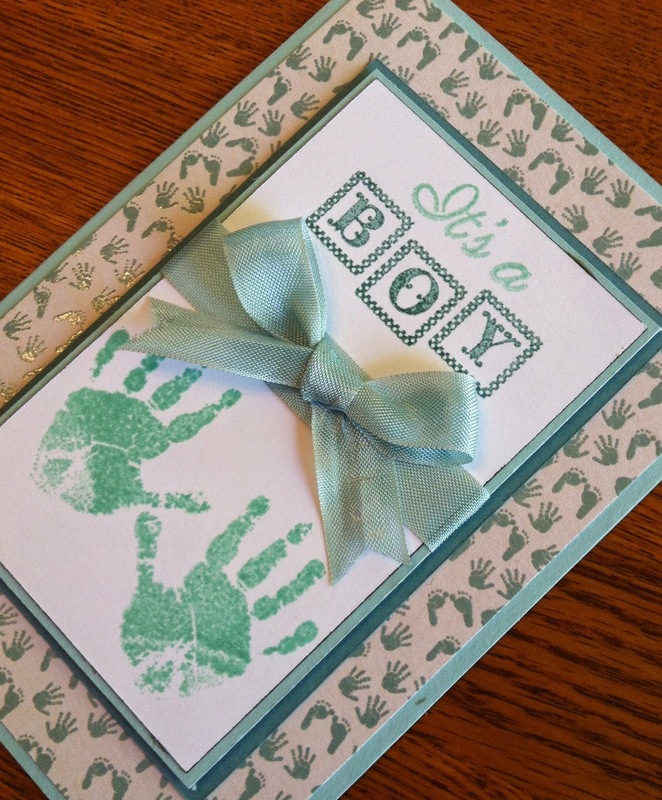 And here's my first ever baby card. I kept as much as possible to soft curves and circles to add to the feeling of softness and femininity. I edged the cut shapes with early espresso marker pen to give them more definition and to help tie the pieces together. I layered two butterflies to give more sense of movement. The two colours predominantly used, Blushing Bride and Soft Suede have worked well together. The Soft Suede helps prevent the pink becoming too saccharine. 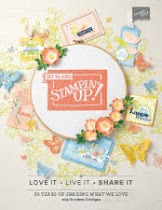 Stamps: SU Kinda Eclectic and Papillon Potpourri, Kaisercraft Pitter Patter clear stamps. Other: Corner rounder punch, Martha Stewart Lace edge punch, Nellies Doily Die, Circle framelits, Butterfly Punch, Heart punch, Kaisercraft Pearls (Blush), scrap of embroidery floss, old shirt button, Early Espresso marker to outline edges, dimensionals bits to support the wings.